You’ve probably heard by now, but the 70’s are back – at least in fashion. I talked about it a bit in a post a little while ago which focused on the 70’s trend that emerged in NYFW. 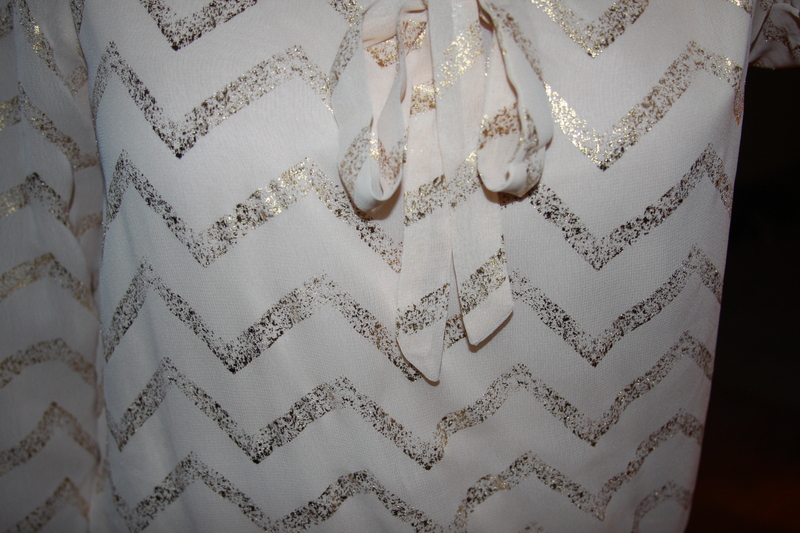 When I got this blouse, what initially drew me to it were the colors and the foiled zigzag stripes. It wasn’t until I actually put it on that I realized it was definitely giving me 70’s vibes. The peasant blouse cut, the foiled stripes and the tie definitely make me think of the 70’s era. I love the sheen of the stripes because it makes it different than the normal striped top. I also love that the foiled stripes are consistent through the ties creating a really cohesive look. I undid the buttons on the wrists so it was a bit looser. Sometimes, I find wrist buttons way too confining for my liking. It depends though. The only thing I don’t love about this top is that the hem is elastic. Normally that wouldn’t bother me too much, but the blouse is a little short, which it’s supposed to be, but that combined with the elastic bottom made me feel like I constantly needed to pull it down. Other than that, I really like this look! Of course, I had to pair it with ash brown pants to keep it that earthy toned 70s look.